Noise is a well-crafted cop movie. It’s a modest, moody character study from Australia with a few inspired set pieces. It’s just the kind of film you might see two years from now, remade by an American director with A-list actors and more explosions. It’s mainstream enough to appeal to general audiences, yet obscure enough that most of us will have missed it. You can find it this summer on DVD locally, or from Film Movement. 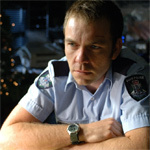 Constable Graham McGahan (Brendan Cowell) was patrolling the subway when he fainted; it might be related to the ringing in his ears he’s had for a year. His boss won’t grant him disability leave; instead he assigns him the brainless, thankless, pointless task of manning a police trailer set up in the neighborhood of some recent murders. The trailer will be there for two weeks, allowing the locals to report any information they may have, in exchange for cookies and condoms. The only taker is a local retarded young man who comes for the cookies. Paralleling Graham’s story of woe is Lavinia’s harrowing tale. Her story opens the film in a powerful, creepy (yet realistic) scene that I won’t spoil. Writer/director Matthew Saville doesn’t even reveal it all — at least not at once. He fills in the gaps in dribs and drabs, later, as Lavinia’s memory starts to work again. But let’s leave it at that. There are murders and there is a cop, but Noise is not a traditional genre film. McGahan is no Columbo, nor is he Dirty Harry. He’s little more than a glorified security guard. He’s a bit like the Freddy character played by Sylvester Stallone in Cop Land: a sad sack, constantly miserable (in part because of the tinnitus), not taken seriously as an authority figure. When one of the locals asks him why he chose his career, he half-mumbles an answer, something about low test scores. This after a few drinks had loosened his tongue, after he philosophized about Heaven and Hell. Both are distillations of your mental state, he figures, in the few seconds after “death” — was your life a waste? Was your death in vain? Or can you move toward the light satisfied with a life well lived? The threads of the story start converging. A suspect in the murder turns up in both Graham’s thread and in Lavinia’s. There is a denoument, and again I won’t reveal anything. Saville plays down the plot, even at the movie’s climax, leaving us in the dark about some of the specific details. Instead, Saville wants us to keep looking at the characters, all the way until the end, and that’s a good instinct for a director to have. For a mainstream movie, and for a first feature, Noise is thematically rich and well made. Check it out now if you like independent movies. And if you miss it, look for an American remake in about 2010.